But wait a minute, Yanks–let’s don’t get too smug. According to the U.S. Department of Agriculture, “Farm Animals are regulated under the Animal Welfare Act (AWA) only when used in biomedical research, testing, teaching and exhibition. 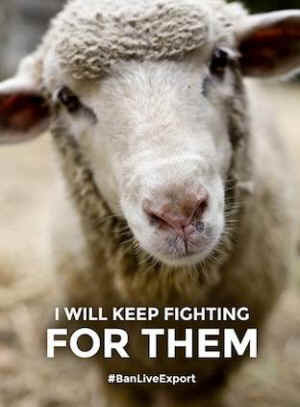 Farm animals used for food and fiber or for food and fiber research are not regulated under the AWA.” This puts a sheep between a rock and a hard place – protected by welfare standards in biomedical research labs, but not in factory farms. Hmmm. Which hell would you choose?!? Sheep and goats, second only to dogs in originally cozying up to humans, were domesticated some 10,000 years ago in Central Asia–sheep most likely from the wild mouflon, an animal resembling the North American bighorn. While wild sheep aren’t intensively exploited the way their domesticated brothers and sisters are, they don’t get off scot-free; they are intensively managed. 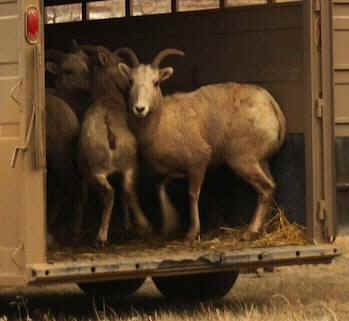 Disease–often transmitted by domestic sheep–is one downfall; hunters’ bullets are another. Aside: If you’ve ever wondered about the seemingly incestuous relationship between state management agencies and hunters – roughly 5% of the population – and their advocacy groups, as well as the management that passes for “conservation,” read the section on hunting in this book – Eating Earth: an ethics-based guide for enviros & animal activists By Lisa Kemmerer. Wild sheep are susceptible to disease–right now they’re dying off just north of Yellowstone, where, incidentally, a couple ranchers raise domestic sheep. Even more distressing is a proposal by the state management agency to snuff out an entire herd and “start over.” Originally a transplanted herd, they’ve suffered disease outbreaks and die-offs over the past 20+ years, resulting in low lamb survival and leaving the herd “stunted” (so managers say) with 50 members, though “(p)redators, competition and poor habitat also share the blame.” Attempts to augment the herd have been unsuccessful. So what does this mean in management-speak? Depopulating. “Wildlife officials are now considering depopulating the herd primarily using hunters to make way for a reintroduction…” Yes, 50 unique, sentient lives could be discarded simply because they aren’t reproducing effectively enough to accommodate management-for-hunting objectives. Speaking of hunting deaths, the local paper delivered a couple of gushing, full-page ammunition store ads over the past few months – the first one wishing happy birthday to a 19-year-old who had completed her Super 10 Slam by killing an immense moose. A month later another full-page ad appeared – this one congratulating the same, insatiable young killer for achieving three-fourths of her Sheep Slam.